It’s fascinating to speculate about the journey of this matrix and the other items in the Collection that have made their way to this Collection to be in Father’s hands to be shared with everybody. The predecessor of Pius IX is Gregory XVI who reigned from 1831 to 1846, and there are a number of items from him in the Collection. One of them is something that shouldn’t exist–it is one of a couple items in the Collection that shouldn’t exist, because they are normally destroyed upon the death of the pope. 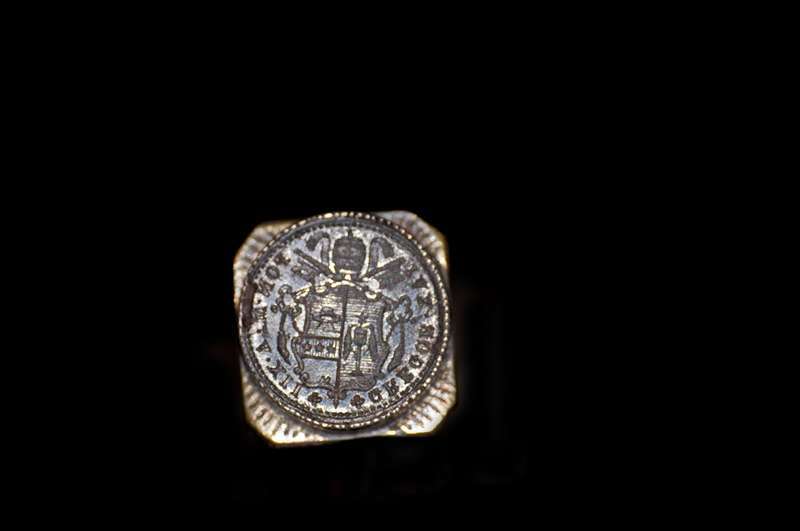 An example of this would be his fisherman’s ring, which was the traditional emblem used to seal documents. The practice of using seals to authenticate Vatican documents began with Pope Clement IV in the 13th century. As the Vatican got larger and produced more documents, too numerous to be sealed in this manner, they didn’t just have the fisherman’s ring, but many additional seals to authenticate and authorize letters. So this item, which should not exist, and which should have been destroyed at the time of his death, would most likely have been an ink seal used to authenticate the documents being produced. For something like this to escape destruction is very rare and is a very nice addition to this Collection. Father Kunst purchased this item by totally liquidating his savings. He saw it on an auction and bid highly. Even though he did not win, he stayed in communication with the seller. 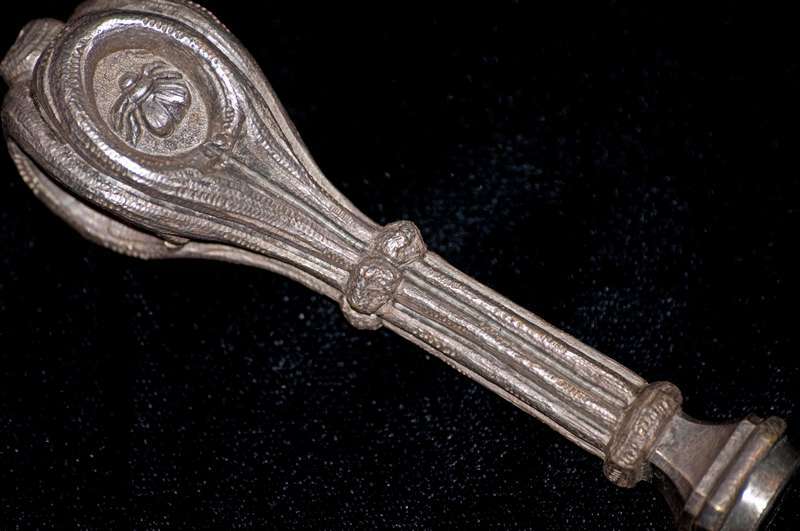 Happily, the person winning it returned it because he was disappointed that the pewter handle was not silver. 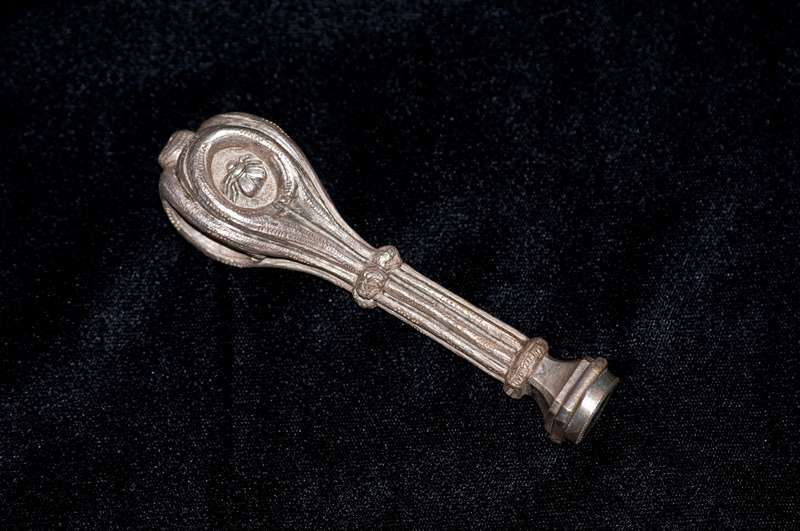 From Father Kunst’s perspective, the fact that it is a seal from Pope Gregory XVI’s pontificate, and should no longer exist, makes it incredibly valuable, and the metal of the handle is not a consideration. It is a one of a kind item in its own case. The person who sold this item is from Italy. When Father inquired how he got it, he said, One does not ask the sisters where they got their items. In other words, a convent or monastery in Europe possessed this item and needed money and sold it. They probably had it since the time of the Pope. Due to a lack of vocations and a need for money, these items are now finding their way onto the market. The seal was definitely smuggled out during the pontificate of Gregory XVI. It most probably stayed in a particular monastery until sold to the person from whom Father purchased it. It would never have been allowed to be released after his death.